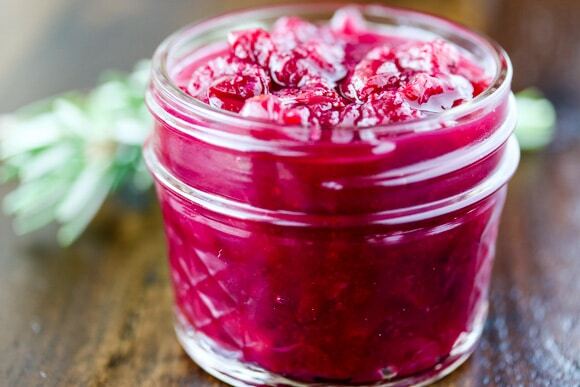 This Instant Pot Cranberry Relish recipe takes only four minutes of cooking at pressure. Easy, healthy, and delicious enough to serve all year round. 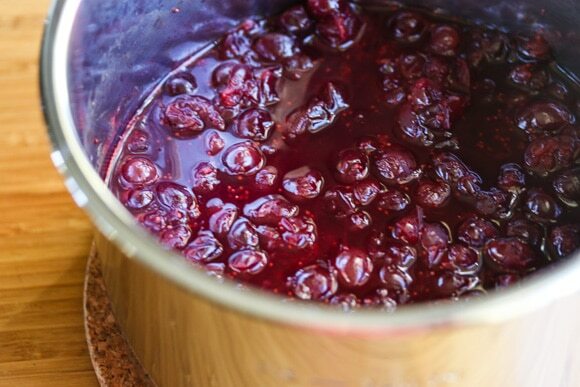 I’m of the mindset that cranberry relish should be a thing all year ’round. It’s not just great with turkey, but can be served with oatmeal, toast, pasta, pancakes, and meatloaf! Am I crazy or do you agree? Cranberries are pretty amazing little berries, they have lots of antioxidants and they’re known for helping to prevent urinary tract infections. They’re just so darned pretty, too. Of course, as anyone knows who has tried to eat a plain cranberry, they’re tart beyond words. 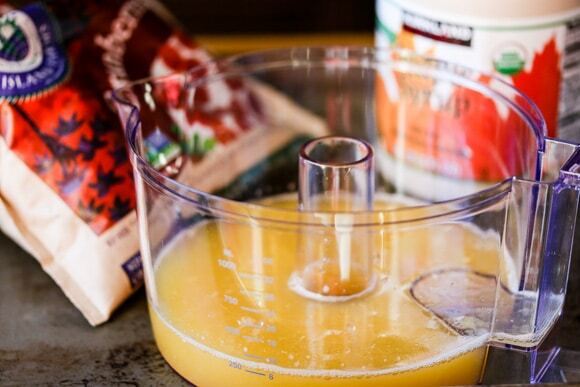 They get sweetened so nicely with freshly-squeezed orange juice and maple syrup in this recipe, and I allow for some adjustment with the sweetness level. If you want your relish less sweet, use only 1/2 cup maple syrup (but add another 1/2 cup water to make sure you have enough liquid). If you want a sweeter more traditional cranberry relish, use the full cup of maple syrup and don’t add any water to the pot. I used my 3- quart Instant Pot for this recipe, but you can also use a 6-quart. I bought the appliance specifically with this exact recipe in mind. To show how easy this recipe is, I made a video! (click thru here if you don’t see the preview). 1. Combine the cranberries, orange juice, and maple syrup in the base of a 3-quart pressure cooker. 2. Cook on high pressure for four minutes and use the quick-release method. Can I use fresh cranberries instead of frozen? Yes, I have tried it both ways. Will the relish thicken as it cools? Yes, it does! I like to make mine the day before I want to use it, and let it cool and thicken overnight in the fridge. I thought you weren’t supposed to cook cranberries in the Instant Pot because of foam? In my experimentation, there is a lot less foam when you use frozen cranberries. I did have foam and sputtering when I tested this using fresh cranberries, so my recommendation is to use frozen cranberries. 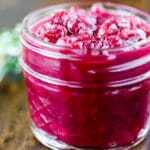 If you like this Instant Pot Cranberry Relish, you might like these other Instant Pot recipes. An easy side dish that can be served all year round. Combine the cranberries, orange juice, and maple syrup in the base of a 3-quart pressure cooker. Cook on high pressure for 4 minutes and use the quick-release method. Serve hot or cold. If you want your relish less sweet, use only 1/2 cup maple syrup (but add another 1/2 cup water to make sure you have enough liquid). If you want a sweeter more traditional cranberry relish, use the full cup of maple syrup and don’t add any water to the pot. 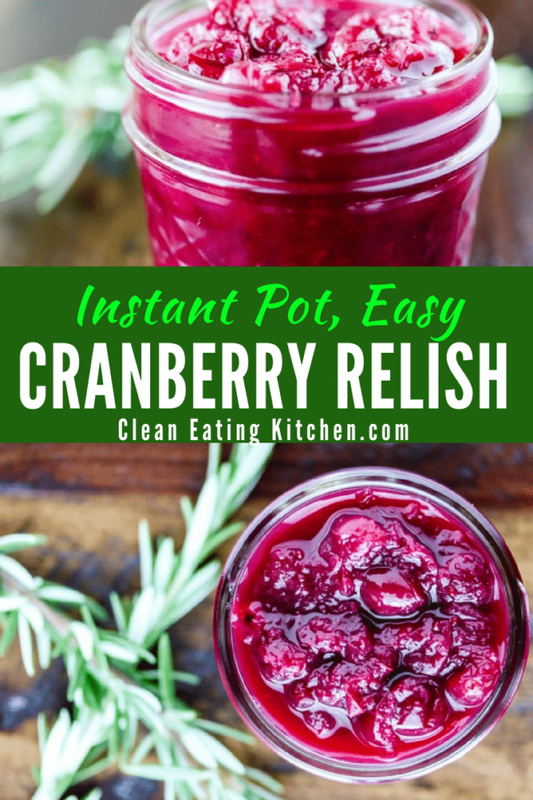 Pin this Instant Pot Cranberry Relish recipe to your favorite holiday recipe board to save it for later! What an easy and yummy instant pot recipe! Thank you! Wow, this is so pretty & I adore cranberry so I’m sure it would be divine in relish! Awwww, so great to hear, Amber! Happy you liked the relish. 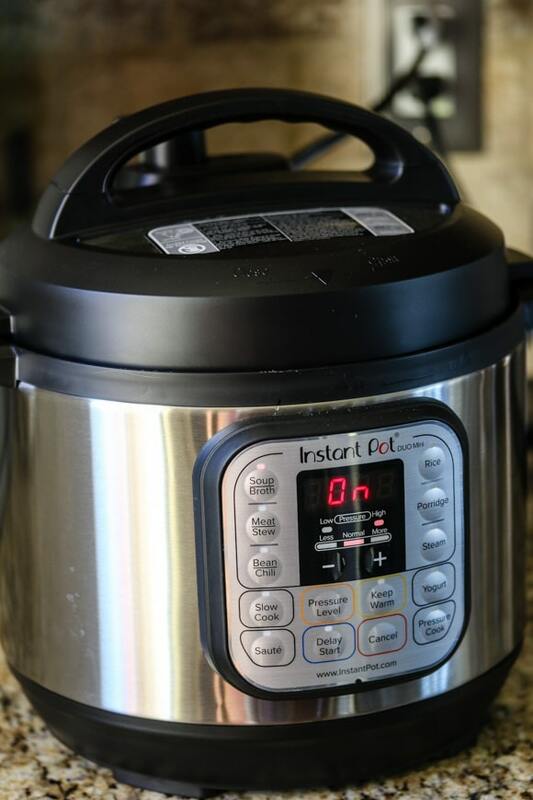 Love instant pot recipes and this recipe is so quick and simple. Amazing ! My mom loves cranberry orange relish. I’ll have to make this for her! Is this something that can be canned/pressure cooked in jars? Ohhhhh, good question, Tammi! Do you mean canned after the cooking process or cooked actually in the canning jars? I am not a canning expert, so I’m probably not the best person to ask! Can I use fresh cranberries instead of frozen? Need to adjust cook time any? Yes, you can use fresh cranberries, Jenni! The directions are the same.